Book hotel rooms online with us at Tivoli Victoria & The Residences at Victoria Hotel at the lowest rate, guaranteed. 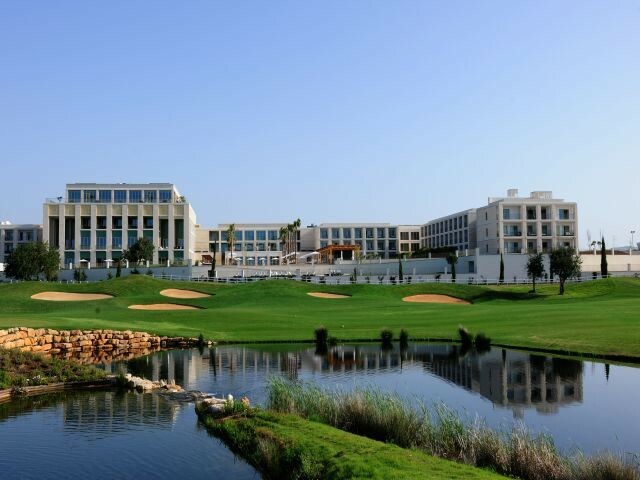 Get your holiday discount room rate at the 5 Star luxury Tivoli Victoria Hotel and Victoria Residences located in the popular golf resort area of Vilamoura in the central Algarve. The hotel has 280 spacious comfortable suites providing holiday accommodation from two to four adults plus two children. The Tivoli Victoria Hotel and Victoria Residences are set overlooking the Victoria golf course and inside it has the Banyan Tree Elements Spa. The modern comfortable suites are air-conditioned have satellite TV, radio, direct dial phones, executive desk, a mini-bar, a safe, luxurious bathrooms and internet access. The Tivoli Victoria Residences are composed of two to three-bedroom apartments sleeping four to six adults and adjoin the main hotel. They are all furnished to a very high standard and have spacious balconies overlooking the Victoria course. Each has underground parking space. There are two pools and one for children, a snack-bar, and a lounge bar, all set in a garden area. Tivoli Victoria Hotel and Victoria Residences share facilities which include the Health Spa with massages and beauty treatments, two restaurants, two bars, an indoor pool, two outside adult pools and one for children, a tennis court, and a well-equipped Fitness Centre. Guests can walk out of the hotel straight into the Victoria Golf Course Clubhouse. The beach is only 7 minutes drive from the hotel.